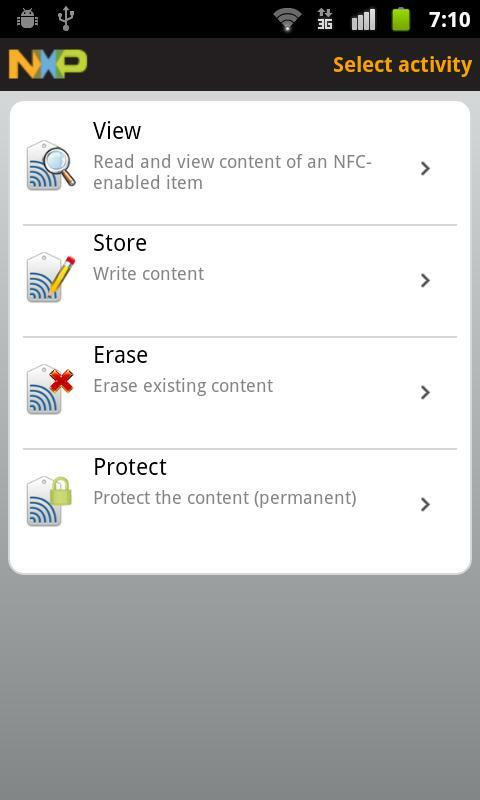 Tagged Android 2.3.3, NFC, NXP. I have a Nexus S with 2.3.3 and this still isn’t downloading for some reason. Any ideas? Try again now. It’s seems that the xml with requirements was bad. 2) is there a possibility to share a codebase, and is it wirtten in java? 3) also are you guys using http://www.llrp.org/ to communicate with the RFID tag? also, is there any plans to make the system ISO 18000-6C compatible (UHF chips)? 1) This is an specific NXP app, so you can use any mifare / desfire compatible tag. 2) Ask NXP, they are the authors. 3) I don’t think so, this app uses the android 2.3.3 api and lib-nfc from NXP. I don’t think so. This app is for NFC, so is using tags in the 13.56 MHz freq. ISO 18000-6C (EPC Gen2) tags operates in a higher frequency (860-960 MHz). Gustavo, thanks for the feedback, appreciate it! I was hacking 2.3.1 API to write on some tags… without success… cause I don’t want to upgrade my Nexus S to 2.3.3. Is there anyone that has already done this upgrade? i have Nexus s with android 2.3.3 and mifare ultralight tags in the 13.56 MHz fre ISO 14443 A from NXP. i would like to write “url” on the tags. but i have always this answer on the monitor: Item type and NFC storage size for “Not formatted yet” and Conten for “Empty”. Do you have any ideas? Thanks! All images and content are copyright to their respective owners.